The Merlino Home Team is a team of local real estate experts ready to reveal how to use the latest marketing techniques including high-end video and “Big Data” to leverage the current market and bring you absolute TOP DOLLAR for your home. From setting the price to creating marketing campaigns for traditional media and Web, our proprietary “Power Marketing” process will match your home with the right buyers for the highest price. We are committed to fast, professional and courteous personal service to help you understand and feel at ease throughout the home selling process. 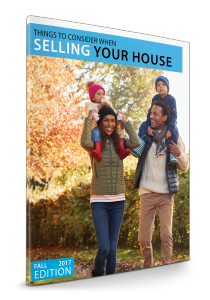 We publish a free guide that is updated quarterly entitled “Things To Consider When Selling Your Home” that will walk you through the bullet points of the process and keep you from making common costly mistakes all too often associated with marketing and selling such a large investment. Download the Fall 2017 guide now by clicking the picture below.